According to all reports Obama is pushing Bibi to give up our sovereignty over Jerusalem, as only the US will decide where and what we can build in our own capital. Obama is nothing more than a typical anti-Semitic anti-Zionist Leftist - but unfortunately with power. One can hope that Bibi is strong enough to stand up against this evil decree.. This Pesach I hope Bibi reads his Hagaddah carefully, and he should know that we fully support him - if he makes the right decision. Bibi might be restricted in what he can say to and about Obama, but that certainly doesn't hold true with what he can say about the "Palestinians". In a talk with US Congressional leaders Bibi said that peace talks “could be delayed for another year” unless the Palestinian Authority lets go of its demand for a full freeze on construction for Jews in Judea, Samaria and eastern Jerusalem. "We must not be trapped by an illogical and unreasonable demand," Netanyahu said. That's right, that demand originated with the Arabs. I was thinking. With the anti-Israeli Obama administration saying so often that as a "friend" it has an obligation to express its criticism of Israel, to air its disagreements publicly, and to tell the "truth", I can only hope that the Netanyahu administration finds it within itself to do the same. The American people deserve to hear and know the truth. The American people deserve to hear how the Obama administration is harming America's standing and deterrent capabilities in the real world with its policies of appeasement and attacking allies instead of enemies. The American people need to hear that "speak much, but carry a small stick" is not good foreign policy (but seems to be reversed when it comes to Israel). America deserves to hear that Obama has taken on the job of advocates for the Arab nations, and is not acting like an honest broker. America needs to know that Obama's lack of experience and far left political agenda has caused the Arabs to take even more hard-line positions than ever before. And those hard line positions are what make peace even more elusive. Obama and his administration repeatedly declares that the US stands with Israel on it's security. And we Israelis believe that. Because we know the American people stand with us. And we thank you for that. We even know that the American people also stands with Israel as a fellow democracy, and for our heritage and what we have given and still give to the world. But we don't believe believe the Obama administration stands with us. And as a friend, America needs to know that most Israelis don't trust Obama, and we believe he wants to change that American policy of friendship and eventually throw us under a truck. That's the hard truth. And as a friend you need to hear that. That's what a friend would do. Or so I've repeatedly heard. It couldn't happen to a better group of people. This blow-up with the US couldn't have happened in any better way. Imagine if we were talking about 1600 apartments in Talpiot or in Pisgat Ze'ev (or a Settlement). Bibi could and would have shut down the project without a second thought. But instead it happened to a Chareidi neighborhood (just like last week at Beitar). Unlike the rest of us sheep, the Chareidim don't take it lying down when someone goes after their housing. They've got major housing shortages, an easily roused population, and aggressive politicians representing them (and we've only got the first). Bibi can desire to back out of this as much as he wants, but the Chareidim are not going to let this go. They're willing to rip apart the coalition and the country before they allow someone to block housing for their rapidly growing population. I doubt Obama and the US administration even understand what they are asking (much less even know where Ramat Shlomo is, with it's 20,000 Chareidi population). Obama is taking on a people that built an exact duplicate of 770 in Israel. Does he really think they're going to let a Cossack like him raid their neighborhood. Michael Oren is saying the the Israel-US crisis is the worst it's been since 1975 when the US tried to force Israel to evacuate the Sinai. Obama's secret plan isn't even secret anymore. It's all coming out of the horse's mouth. Jerusalem is to be divided. Bibi may not have what it takes to stand up to Obama by himself, but he is right to be more afraid of the Chareidim. So if that is what it takes for him to stand up to Obama and defend Jerusalem (and hopefully the rest of Eretz Yisrael), then this clearly could not have happened to a better group of people. There’s a lot of money in the Peace Business. There’s a lot of honor in the Peace Business. And there are a lot of ways to attack Jews in the Peace Business. The only thing missing in the Peace Business is Peace. As Peace talks loom, approach, and are imposed on us from above, the one guarantee we have, and that we witness everyday, is that attacks on Jews will increase exponentially. Peace is not the real goal of the Peace Business. Consider who we are being asked to make Peace with. Our options are either the religious Hamas who have vowed to destroy us, or nationalist Fatah who have vowed to replace us (but in much more polite language). Just today Fatah (our “Peace Partners”) confiscated the home of Fahmi Shabaneh. Shabaneh exposed the tip of the iceberg on how the Peace Business works. He began to expose how much Peace money the PA (Abbas’s close friends) has embezzled and how corrupt it’s officials are. For that act of treason, the PA confiscated his home and property. Shabaneh was apparently hired by the PA and Abbas to dig up dirt on PA allies and opponents so the PA higher-ups could use it against them. But since the higher-ups are even more corrupt, it apparently wasn’t very difficult to gather information on everyone involved in the Peace Business and the PA in general. I don’t know if Yishai’s announcement was planned with Bibi or not, but anything that stalls and delays the imposition of the Peace Business on us – is a good thing (besides that Jews building in Jerusalem is a good thing). Chareidim have it good when it comes to government representation. When they build their towns and neighborhoods, everything gets built at once, shuls, shopping centers, schools, and they even get transportation lines. But when we non-Chareidi settlers build, everything is a fight. Even just to improve the hours for a bus line can take years. And look what happened yesterday and today. 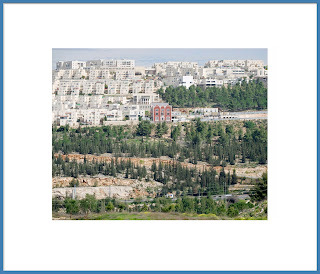 Yesterday, 112 new homes in Beitar were announced. And today in Ramat Shlomo (part of Jerusalem, so it's not really a big deal), 1600 new homes were announced. Where are our Settler representatives? Why aren't they fighting and succeeding for us, like the Chareidi representatives fight and succeed for their constituencies? In his previous term, Bibi made a big deal out of reciprocity. Yet that seems to have fallen by the wayside. Right now, the good people of this country are suffering through Bibi's settlement freeze. And the funny thing is, Bibi has inadvertently created a perfect tool to fight the incitement and violence of the Palestinian Authority. Unless you've been living under a rock, you'll have noticed that the PA (and the family of organizations supported by the NIF) have been organizing and sponsoring more and more violent and dangerous protests throughout the country. And as we get closer to "Peace Talks", Abbas and the PA raise their rhetoric, incitement, and violence. Meanwhile it seems that Israel simply doesn't know how to respond to these threats at all. I mean, not at all. Well here is one idea. Israel should announce a new policy of reciprocity. Anytime the PA praises, awards or promotes a terrorist, a new outpost should be built. After every joint PA-Lefty protest another Yishuv should be allowed to build. Put a price on their actions. And make it clear they are footing the bill. Will Bibi do this? No. Because this country is led by a bunch of frierim. We do and give up everything for a fake Peace and just get more violence and hate back. We're acting like a bunch of Turkish Jews. Jews are an amazing breed. You can kick them and beat them over and over, and still the message won't get in. This past Shabbat, Turkish authorities raided a Synagogue during prayers. Come on people, what kind of wake up call do you need? Yellow badges like they're now planning in Iran? Considering the US finally recognized the Armenian genocide by the Turks, you would think that the precedent of then and the acts of now would be enough. Move to Israel while you still can. The Kinneret Color System is confusing. There's a red line, another red line, a black line, and probably a few others. 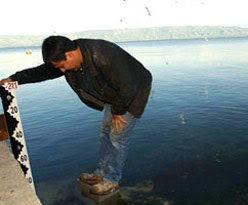 It's probably a reflection of Israel initially setting the red line under which there isn't enough water to draw water from the Kinneret, and then when the water passed that red line, they set another red line, that said, OK, that first red line was just a warning, the next one is really important. (Sort of the way Israel negotiates peace). Anyway, with all the rain we've had, the water level has gone above the red line, which apparently is more like a yellow warning line. It hasn't reached the level where they open the sluice gates to prevent flooding (that's a few more meters higher). But all in all it's brought back the Kinneret to a level it hasn't seen in a long time, though it could use more. I assume the aquifers (which no one is mentioning) are also in better shape too with all the rain we've been having.